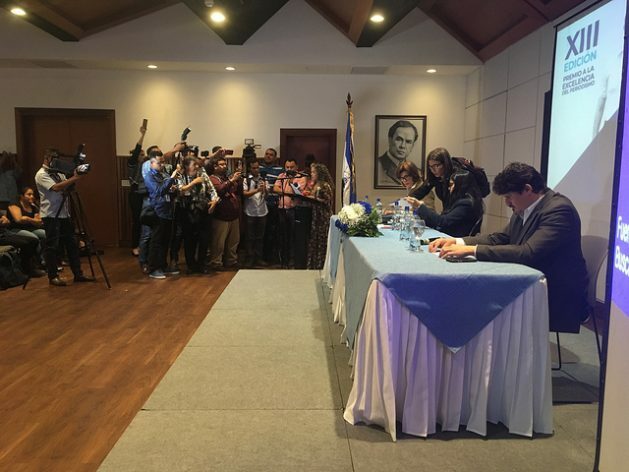 MANAGUA, Jan 15 2019 (IPS) - Eight months of social and political crisis in Nicaragua have hit the exercise of independent journalism in the country, with 712 cases of violations of the free exercise of journalism, one murdered reporter, two in prison and dozens fleeing into exile, in addition to several media outlets assaulted by the security forces. A report by the non-governmental Violeta Barrios de Chamorro Foundation, called “2018 Year of Repression against Press Freedom in Nicaragua”, published on Jan. 9, states that between April and December there were 712 violations of press freedom and the exercise of journalism. Medrano refers to journalists Lucía Pineda and Miguel Mora, press director and owner of the television news channel 100% News, respectively. They were arrested on Dec. 21 at the station’s headquarters and later charged with “provocation” and “conspiracy to commit terrorist acts”. Before they were arrested and were incomunicados for several days, sympathisers of Daniel Ortega’s government filed a report against Pineda, Mora and other journalists from the channel at the Public Prosecutor’s Office, accusing them of “promoting hatred” because of their critical editorial line. Their families and lawyers have not been able to see the journalists, who are to be tried later this month. The TV station was shut down, its signal taken off the air and its accounts and assets seized by the authorities. The arrests of the two journalists triggered protests by international human rights and press freedom groups. The Committee to Protect Journalists (CPJ) issued a statement backed by 300 leading journalists from around the world condemning the arrests and demanding their prompt release. 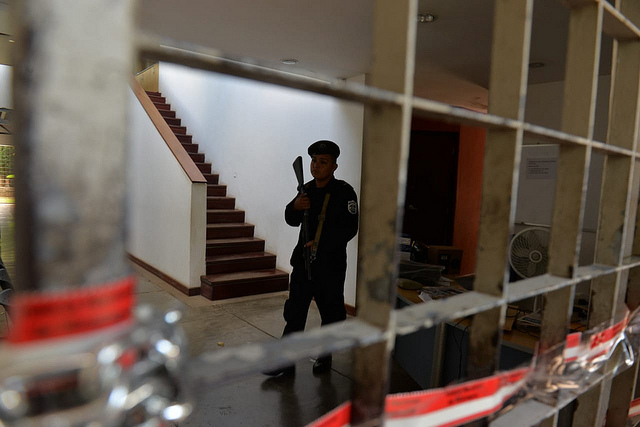 The document also includes a strong condemnation of the Nicaraguan government for the assault and seizure of the newsrooms of the Confidencial magazine, the Niú website and the television programmes Esta Semana and Esta Noche. 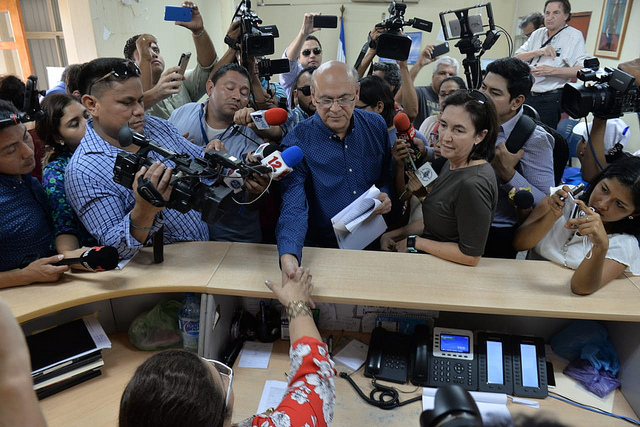 The magazine and TV programmes belong to journalist Carlos Fernando Chamorro and the Dec. 14 seizure marked the beginning of Ortega’s last, radical offensive against independent journalism. Apart from the criminalisation of the two journalists, the report details that a reporter was killed in April, at least 54 have been exiled because of threats and political persecution, and 93 were beaten and injured. In addition, 102 media outlets and journalists were censored, 21 suffered judicial harassment or investigative processes and 171 have faced different forms of intimidation. “It’s a situation we haven’t seen since the years of the Somoza (dictatorship), not even during the contra war against the United States. It’s terrifying,” writer Gioconda Belli, president of the Nicaraguan chapter of PEN-International, told IPS. According to the writer, the regime of Ortega, a former Sandinistaguerrilla, “has surpassed the horrors of the dictatorships of the past that Latin America remembers” by targeting peasant farmers, students, feminists, religious sectors and, finally, journalists and the media. “He has committed the atrocity of accusing journalism of terrorism; he has kidnapped and prosecuted two journalists, Miguel Mora and Lucía Pineda, as criminals; he has assaulted newsrooms and confiscated private media outlets, such as the Confidential,” she denounced. In addition, “now he wants to strangle La Prensa by denying it paper,” Belli warned. The newspapers with the largest circulation in Nicaragua, La Prensa and El Nuevo Diario, both opposition papers, have reported that their paper reserves will be exhausted in a few months and that the customs authorities are blocking imports of raw material. A small newspaper, Q´hubo, published by ND Medios, closed down in December due to a lack of paper. The building where the Confidencial magazine operated was taken over by the National Police, after the legislature eliminated the legal status of several non-governmental organisations. However, Chamorro stated that both the office building and the censored media outlets belong to the company Invermedia and Promedia and have no relation whatsoever with the NGO that was shut down. Ortega, 74, ruled the country between 1985 and 1990 as leader of the Sandinista National Liberation Front (FSLN), which defeated dictator Anastasio Somoza in 1979. After the triumph of the Sandinista revolution, he was also a member of the government junta. The current crisis in this Central American country of 6.4 million people began in April 2018, triggered by a controversial social security reform that was later withdrawn, revealing broad discontent with the government. The protests, led by university students, lasted until July, and according to the IACHR, 325 people were killed during the unrest, mainly at the hands of police and irregular forces organised by the government. “The accusations are absurd, they seek to silence critical voices, but they won’t succeed, because we as journalists are going to continue reporting from anywhere, from exile, from prison, from social networks, from clandestinity, from everywhere,” he told IPS from Miami. Journalist Jeniffer Ortiz, director of the digital platform Nicaragua Investiga, told IPS that she left the country because of direct threats against her for her journalistic work. “I have been away from Nicaragua for a couple of months. I left because of the constant threats and sieges of our house. They were also sending us messages through the social networks,” she said from San José, Costa Rica. She said that due to the increasing repression, many of her sources stopped talking to her media outlet which, added to the economic crisis and threats, forced her to continue her work from outside Nicaragua. “We are now in exile aware that our colleagues there are finding it increasingly difficult to do their work because of threats. The sources are afraid, and from here we can continue our work and contribute to the daily flow of information that people are asking for,” she told IPS.